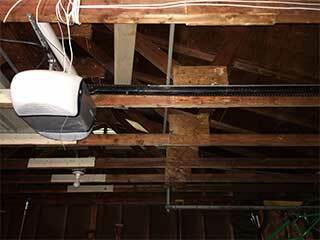 Garage door-openers used to be a luxury but they are now seen more as a necessity. We know our local community needs a garage door company it can count on and this is a position we aim to fill. We offer a range of servces when it comes to the repairing or replacement of openers. A garage door opener makes life a lot simpler. Once installed, all you have to do is push a button or flip a switch to operate your door. Our experts can help you choose the right opener for your door's weight and size and look after the full installation process for you. Call us today to book your appointment! All garage door openers are operated by drives. There are three main different kinds: The most commonly used is the chain-drive which is noisy but operates well. The screw-drive is quieter and mid-range when it comes to price. The belt drive is very quiet with next to no noise at all but it can be a bit more expensive. With a number of openers available out in the market today, we can help you decide which drive is best for you and your door system. In addition to our installation services, we can carry out garage door troubleshooting for you as needed and identify any opener-triggered problems. For example, if your door is behaving unpredictably and opening and closing when you don't expect it to, this could indicate a problem with the safety sensors which you should get looked at as quickly as possible. Modern openers come equipped with photo-electric sensors on each side of the opening. They are designed to alert the system when a person or an object gets in the way, this is why it is so important to get your opener looked at if you suspect a problem here. Whether you already know that you're in need of a new opener or suspect your current one may simply be in need of some maintenance work, contact our experts at Garage Door Repair Escondido, California, we'll be happy to discuss your needs with you.